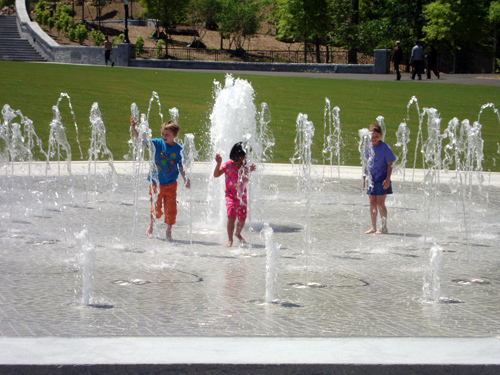 The new Legacy Fountain is now open in Piedmont Park. Part of a 53-acre expansion, the new Piedmont Park Promenade features two sprawling meadows, the Fountain, and a new woodlands and wetlands area, all adjacent to the Atlanta Botanical Garden. The Legacy Fountain features more than 70 water jets that spray up to 30 feet into the air, as well as an LED-lighting system capable of a million lighting configurations...that's going to make for some spectacular shows! Visitors can get to the Legacy Fountain, which is fully stroller and wheelchair accessible, via Piedmont Park's northeast quadrant or via the public path that also leads to the Atlanta Botanical Garden from Piedmont Avenue.